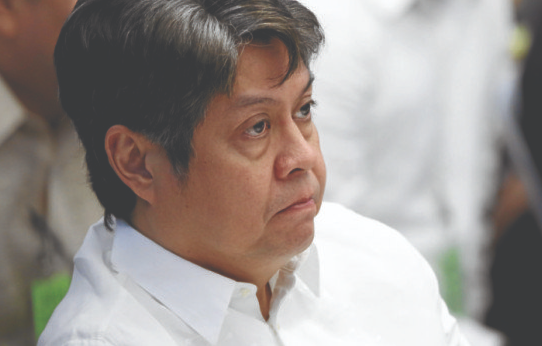 Home / Opinion / Retired Judge to Kiko Pangilinan: "PAANO KA NAGING SENADOR? " Retired Judge to Kiko Pangilinan: "PAANO KA NAGING SENADOR? " Retired Judge and political analyst Mr. Antonio Lubao recently took to Facebook to share a very striking opinion and expressed his dismay to Senator Francis "Kiko" Pangilinan for the latter's remarks regarding the supposed third Telco and the government contracts with China. The former judge of the Regional Trial Court (RTC) enunciated his anger to the senator and shared a photo from News5 with Pangilinan's statement, questioning Davao-based businessman Dennis Uy’s expertise on telcos. 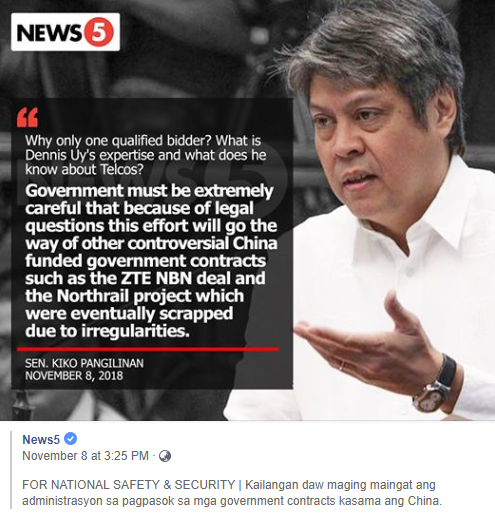 Pangilinan on that account allegedly said that more than security concerns, he was additionally seeing legal, technology and policy concerns in the entry of the third telco in the country. These remarks of the senator made Judge Lubao really mad, that on his recent Facebook post, the former Judge lambasted Pangilinan and actually called the senator an utterly foolish and senseless person. "PINAKA-GAGO, PINAKA-TANGA, PINAKA-ULOL TALAGA ITONG SI KIKO PANGILINAN! ", the former judge wrote. Likewise, Lubao stressed that the irregularities the senator was actually talking about was allegedly their own irregularities, that of the Liberal party's and the opposition's. The retired judge similarly scrutinized Pangilinan's credibility and how the latter actually become a senator. He then compared Pangilinan to Senator Manny Pacquiao who recently had a knockout speech in Cambridge Union and said that the professional boxer and senator is in fact more brilliant and more humane than him and all of the opposition. "NAKA-PAG-SALITA NA BA KAYO SA CAMBRIDGE UNION? MAS MAUTAK AT MAS FULL OF HUMANITY PA SI MANNY PACQUIAO KAHIT NA PAG-SAMA-SAMAHIN PA KAYONG LAHAT. ", he fiercely stated. He thereupon reminded Pangilinan of their alleged anomalies and ended his post by saying that the senator should reflect on, look himself in the mirror and wake up from a profound sleep. "MANALAMIN KA ULIT AT BAKA MAGISING KA NA SA MAHIMBING MONG PAG-TULOG! ", Lubao ended. "PINAKA-GAGO, PINAKA-TANGA, PINAKA-ULOL TALAGA ITONG SI KIKO PANGILINAN! YES, THE CONTRACTS YOU MENTIONED BELOW WERE ALL DECLARED NULL AND VOID BY THE SUPREME COURT BECAUSE OF IRREGULARITIES ATTENDANT TO THE EXECUTION THEREOF. BUT ASK YOURSELF, GUNGONG, WHOSE IRREGULARITIES? HINDI BA IRREGULARITIES INYO LAHAT NUONG KAYONG MGA LP AT MGA DILAWAN ANG NASA MALACAÑANG? MANALAMIN KA MUNA, ULOL! TANGA MO TALAGA! PAANO KA NAGING SENADOR? 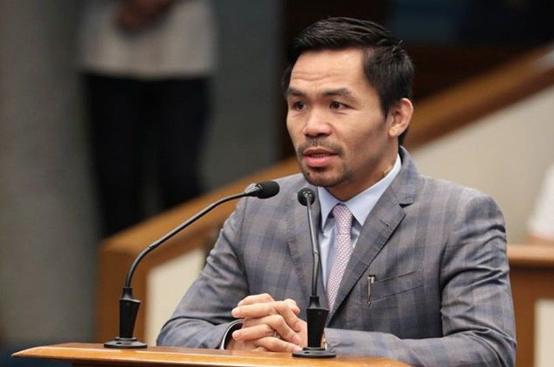 ANG BABA NG TINGIN NINYO KAY MANNY PACQUIAO DAHIL KULANG SA FORMAL EDUCATION. 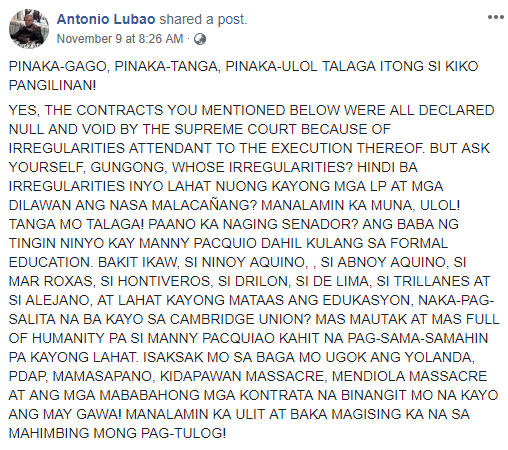 BAKIT IKAW, SI NINOY AQUINO, , SI ABNOY AQUINO, SI MAR ROXAS, SI HONTIVEROS, SI DRILON, SI DE LIMA, SI TRILLANES AT SI ALEJANO, AT LAHAT KAYONG MATAAS ANG EDUKASYON, NAKA-PAG-SALITA NA BA KAYO SA CAMBRIDGE UNION? MAS MAUTAK AT MAS FULL OF HUMANITY PA SI MANNY PACQUIAO KAHIT NA PAG-SAMA-SAMAHIN PA KAYONG LAHAT. ISAKSAK MO SA BAGA MO UGOK ANG YOLANDA, PDAP, MAMASAPANO, KIDAPAWAN MASSACRE, MENDIOLA MASSACRE AT ANG MGA MABABAHONG MGA KONTRATA NA BINANGIT MO NA KAYO ANG MAY GAWA! MANALAMIN KA ULIT AT BAKA MAGISING KA NA SA MAHIMBING MONG PAG-TULOG!"